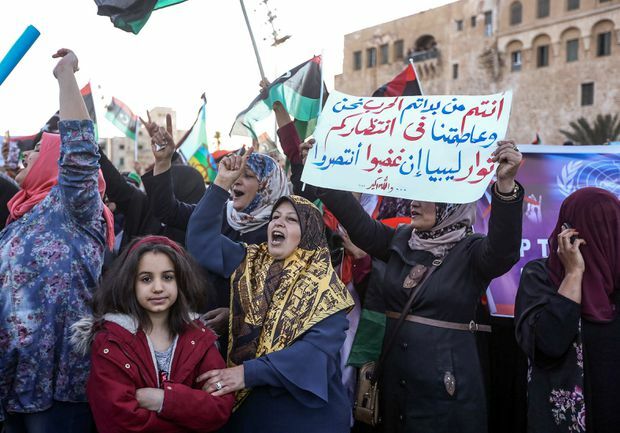 A Libyan woman holds up a sign in Arabic during a demonstration against strongman Khalifa Haftar in the capital Tripoli's Martyrs Square on April 12, 2019. France, which has oil assets in Libya though less than Italy, has called for a ceasefire – albeit more reluctantly than Rome – while also echoing Haftar’s narrative that some extremists were among the Tripoli defenders. Should those escalate and refugee numbers swell, then it may be forced to be more pro-active in pressuring Haftar. “While France is keen to project its Libya policy as a homegrown policy, in reality France merely follows the UAE – more or less,” said Jalel Harchaoui, research fellow at the Clingendael Institute think-tank in The Hague.